On the 8th of October 2013, I stood before 200 occupational therapy students at Queen Margaret University with my knees shaking (trying to block out the fact I was been filmed and live streamed)! I was about to give a presentation on Living Well with Dementia. This was part of a workshop which was hosted by Elaine Hunter @elaineahpmh in partnership with QMU and Alzheimer Scotland The workshop was called “Communication and Making Connections in Dementia” and aimed to develop the students’ understanding of the importance of person-centred support. In the lead up to presentation, I kept asking myself why I hadn’t said “Yes” when Jenny Reid had asked me if I had anything in my diary on the 8th October?! Anyone who knows me is aware of my anxiety levels around giving presentations (perhaps the fact that I constantly talk about it and imagine the worst is going to happen is a giveaway)! But then I also understand that things won’t change unless we tell people about what is happening. People with dementia and their carers are brave enough to stand up and speak about what they believe in, so why shouldn’t we all? I started the presentation by showing pictures of when I did my bungee jump, saying that I felt less nervous then! What I was really there to speak about was the Home Based Memory Rehabilitation (HBMR) Programme, which is an evidence based occupational therapy early intervention programme for people with dementia. The Mental Health occupational therapy service is piloting this in NHS Dumfries & Galloway and it is something I believe in. The pilot came about because we felt that we weren’t always receiving referrals for people early on in their dementia journey. We were keen to carry out more early intervention work in order to promote independence and maintain skills for longer. 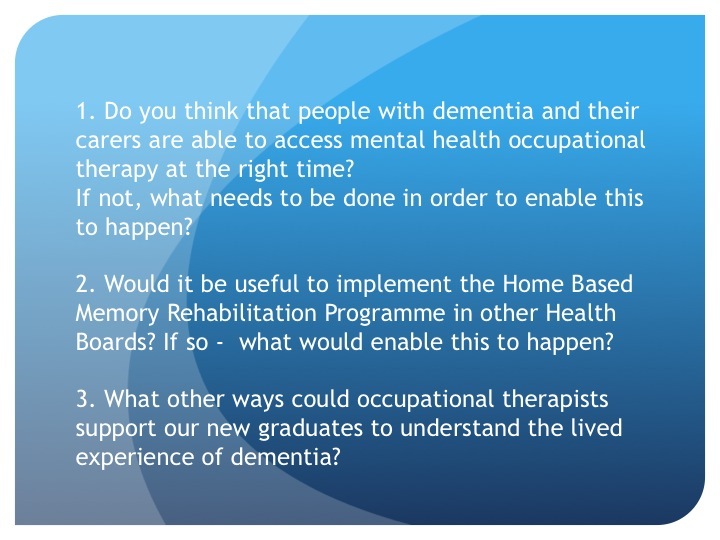 A colleague, Wendy Chambers, occupational therapy team Leader had identified the HBMR Programme in the College of Occupational Therapy (COT) fact sheet: ‘Occupational Therapists help those with dementia and their carers’. We had a discussion and this seemed to be exactly what we were hoping to focus on. The six week programme was first established in Belfast in 2007 and was aimed at people newly diagnosed with a dementia to help compensate for memory difficulties impacting on everyday function, maintain independence and reduce caregiver burden (McGrath & Passmore, 2009). Mary McGrath was contacted and she was happy to share information and for us to commence our own project. This is something I appreciate about AHPs, people are always happy to share their ideas/good work and encourage others to take this forward in their own areas – Thanks Mary and everyone else! A lot of work went in to setting up the Pilot – formulating an SBAR, designing a leaflet (see below, house illustration done by a talented lady with dementia), consulting with various people, agreeing criteria etc. The enthusiasm and commitment from the two occupational therapists (Emma Coutts and Corinna Sidebottom) involved in the project was instrumental in taking it forward. We linked in with three local Memory Clinics, in order to directly pick up referrals. In the past, it may have been that if these people appeared to be coping relatively well, they wouldn’t have come to occupational therapists. Information is gathered from the person with dementia and carer on initial assessment. 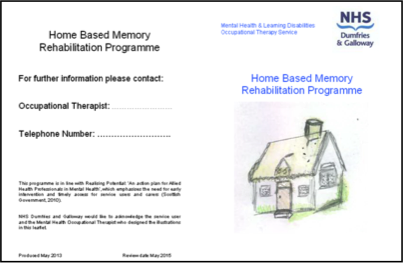 The programme is individualised and focuses on memory and compensatory strategies such as Memory books, Memory boards, Daily checklists, Prompt cards and Tip sheets. Regular practice by the person and carer is encouraged and positive reinforcement is provided. Initial findings include regular use of the strategies, improved mood and confidence, and carers reporting less reliance on their support (also an improved referral rate). During some of the Emotional Touchpoints evaluations, a sense of hope comes across. 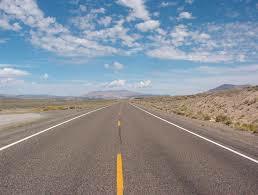 A three month review will be carried out to determine whether the strategies are still being utilised. The Belfast Study found that 50% of people were still using strategies 24 months after completion of the Programme. I hope that we will be able to demonstrate that if people are empowered and given the right tools early on in their dementia journey, they can live the life they want to for longer. However they need to have access to AHPs in order for this to happen. Similar to previous bloggers, I am also excited by Commitment 4 of Scotland’s Dementia Strategy 2013-2016. I believe that we have a part to play at every stage of the person’s dementia journey but that’s a whole other blog………(and presentation?!). I hope that we can all continue to keep leaping to improve things for people with dementia and their Carers!